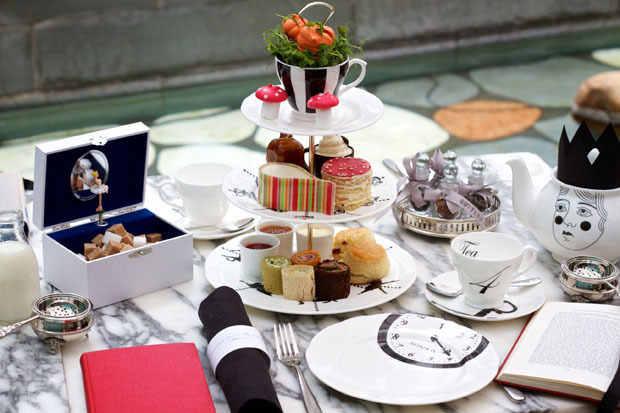 Since launching, the tea has constantly evolved to reflect the seasons and become increasingly elaborate. Collaborating with Shoreditch-based Luna & Curious, who designed the wonderfully eccentric crockery with kings and queens, zebras and birdcages (available to purchase in the rather swanky hotel shop), the attention to detail is exceptional and intriguing; with napkins wrapped in riddles, sugar cubes contained within a whimsical ballerina musical jewellery box which plays “Somewhere Over the Rainbow”, and afternoon tea menus hidden inside vintage Alice’s Adventures books on the table – a nice touch and one that our single neighbour enjoyed by reading as she dined. Served daily in the hotel’s stylish Courtyard Garden (covered and with heaters should you require them), the experience is tactile, imaginative and the perfect way to enjoy a girly afternoon. 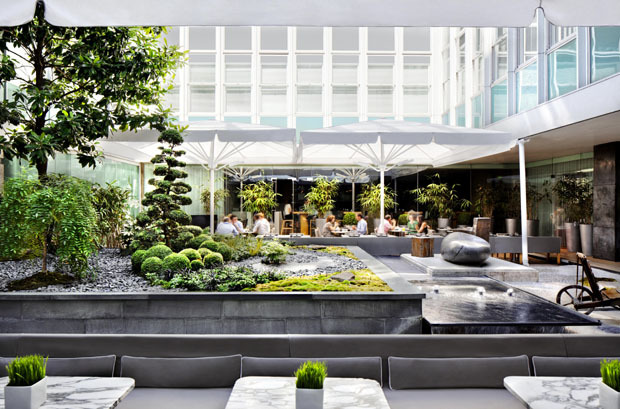 Just a stone’s throw from Oxford Street, the sanctuary of the Japanese-inspired garden is one of the few al fresco spots in the capital for afternoon tea. The tea menu, with a good selection of quirky cocktails, encourages you to see this as a “party” in the true sense of the word. As we were sipping a glass of Laurent-Perrier champagne, our waitress brought a selection of flavoured leaf tea in dinky glass bottles that we were invited to sniff and choose; strawberries and cream, rhubarb and custard or apple pie. I went with the aromatic and hunger-inducing apple pie, as heady as going to my grandma’s for the weekend and which went surprisingly well with the sweet and savoury treats awaiting us. The three-tiered tea stand becomes an Adventure of excitement; topped with carrot meringues on a bed of pea shoots, and strawberries and cream flavoured toadstool mushroom marshmallows (also, I discovered, rather delicious when floated in a cup of tea.) The second tier includes chocolate cups containing a fluffy green tea and white chocolate cream laced with popping candy, the white rabbit’s pocket watch having been turned into a heavenly-tasting layered strawberry Victoria sponge iced with a clock design, and the teardrop shaped cheesecake encased in rainbow-coloured striped white chocolate and oozed a liquid mango centre. The third tier, which we naturally started with, featured dainty asparagus quiches and roulade-shaped sandwiches including smoked salmon and lemon butter on rye bread, cucumber and chive cream cheese on spinach bread, and smoked Cumbrian ham with wholegrain mustard on sun-dried tomato bread, and although you expect afternoon tea to be sweet-heavy it was compensated by deliciously crumbly savoury scones with herb butter, served alongside the classic fruit version and jam. It’s hard not to revert back to childhood when drinking with a mini straw from a tiny potion bottle labelled “drink me”; a layered sensation of passion fruit, coconut and banana. Without doubt the most witty afternoon tea to be had anywhere – there’s even a “Jelly Wonderland” in the theatrical form of a Phillipe Stark cake trolley loaded with wibbly wobbly jellies, all made in Victorian moulds in a wide array of fruit flavours. This is one novelty tea that doesn’t simply look good, it’s a culinary delight. There was only one disappointment, I’d heard a rumour that the tea would be hosted by the Mad Hatter himself, but sadly there was no sign of Johnny Depp. 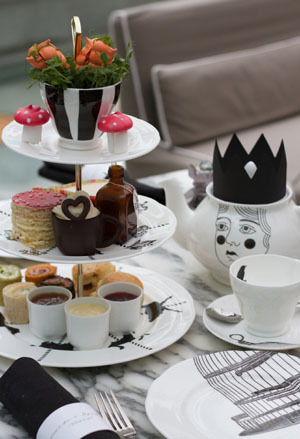 The Mad Hatter’s Afternoon Tea is served daily at The Sanderson Hotel, 50 Berners Street, London, W1T 3NG and priced £35, or £45 with a glass of Laurent-Perrier Champagne. For reservations telephone: or visit the website.